I know. You’ve heard me tackle this subject before on my blog. But it’s a topic worth revisiting You have to take the bull by the horns and develop the skill of dealing with confrontation. When you manage employees, it’s the most important part of your job. Ignoring problems has far reaching business impact. Yet the one thing that I’ve found that has been consistent over my years of coaching managers on how to manage is the fear of dealing with difficult employees, or difficult workplace situations directly. 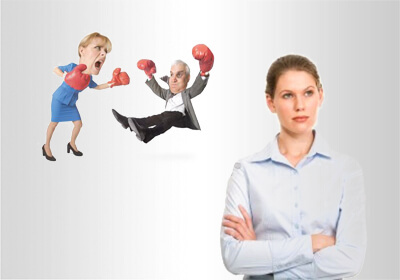 I recognize that confrontation at almost any level is very difficult for most supervisors. Most of us care about what others think of us. We want to be liked and respected. It’s hard to be the “bad boss”. It’s even harder to have to deal with someone who might be confrontational, argumentative, even intimidating. * Issues doesn’t go away and can actually become even more complicated and harder to tackle. * Employee morale is affected. * Your best employees almost always become resentful and unhappy. You won’t always know that they are resentful or unhappy because they won’t tell you in most cases. The first step is to make the decision that you will address problems when the issue occurs and that you won’t shy away from delivering difficult messages. Use the information from your bullet points as your talking points when you have your conversation with your employee. I’ll be sharing more information soon on a step by step action plan for managers at all levels that will assist you with dealing with difficult situations; including how to have the difficult conversation and specific “talking points” based on a variety of possible workplace issues that will help you with having that difficult conversation. In the meantime, make a promise to yourself to take steps to address issues immediately. Be sure to put: “Difficult Situation Coaching” in the subject line. Your article covers a very important issue faced by members of management, the fear of confronting a difficult employee. These difficult employees are not only a problem for the manager, but also a distraction to the other employees as well. Open, honest, and transparent conversations with the employee can usually help to reach a resolution. Thanks for the insightful read.